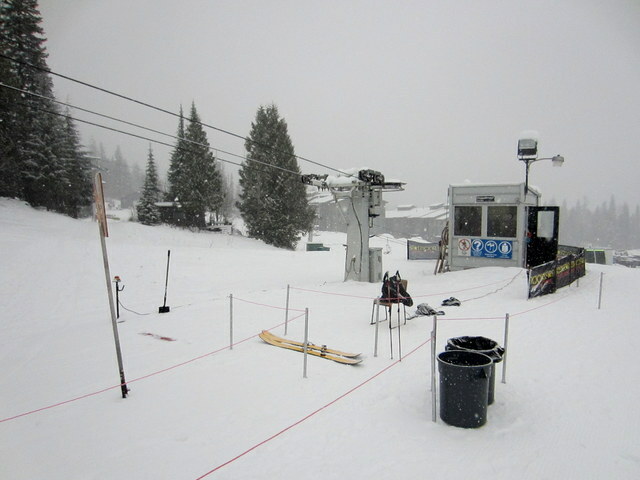 It’s week later than scheduled, and only the T-Bar, but ski season has started at Red. I arrived about 10 to 9, expecting that some keeners would have lined up early, but was the only one. Eventually a few people showed up for easy soft groomer skiing, with heavy snow falling all day. After 10 laps I was pretty bored, so toured up for a run on the Cliff. Off-piste the 10cm of heavy schmoo from yesterday had frozen into a punchy crust and was topped with perhaps 5cm of new snow. I wasn’t sinking into the alder, and the turns were ok.